The college provides gaming opportunities like table-tennis, badminton, volleyball, cricket, football and basketball, etc. Several events such as technical quiz, GD, paper presentation, software contests, extempore and mock interviews, etc. are conducted. The college has a Holistic Centre which provides Yoga classes for students and staffs. Specialists in Yoga take the classes. It works to spread awareness among individuals for a better management of life. To organise sports events in campus and outside TACT has constituted a sports committee. The committee has seven faculty members including one sports officer. The Sports and Games committee organizes intra-college as well inter-college events, which are evenly spaced throughout the year. The main objective of the Sports committee is to develop an all-round personality of the student as well as inculcate values like teamwork, co-ordination and leadership while exploring talents. For intra-college we have events for various sports like football, cricket, volleyball, basketball ball, Badminton , table tennis, carom, chess, etc. 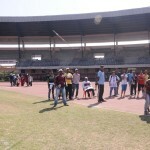 whereas, inter-college events include Cricket, football, basketball, volleyball and table tennis. All the events are conducted such that boys and girls get an equal opportunity to participate in all the events. The objective of the Sports committee is to promote, organize and conduct sports activities. It aims to foster team spirit and sportsmanship of the players to inculcate & enhance a sense of discipline and the spirit of true sportsmanship; to undertake and conduct intercollegiate tournaments of sports activities from time to time. 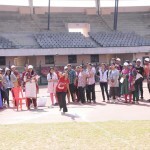 In addition to the above events our college organized annual athletic meet at Kalinga Stadium 30.01.16 where a large no of students were participated for various running, throwing and jumping events. Our cricket team won the championship in inter college cricket tournament organized by Red Bull held at Kalinga Stadium. For conducting the events like Badminton, cricket, football and annual athletic meet we hire the ground outside the campus where the student use the best infrastructure facility . Our college has participated in Volleyball tournament held at HIT, BBSR. Our college has participated in Volleyball, football and cricket in intercollegiate tournament held at CUTM, BBSR. Our college has participated in cricket tournament held at TITE, BBSR. Our college has participated in Volleyball tournament held at SIT, BBSR. Our college has participated in Basketball, badminton tournament held at CET, BBSR. Our college has participated in Volleyball tournament held at GEC, BBSR.